DRAINBOSS PLUMBING AND DRAINAGE LTD. TERMS AND CONDITIONS. These terms and conditions apply to DrainBoss Plumbing and Drainage Ltd. Emergency Plumbing, Drain and Gutter cleaning services. Please read this document carefully as it will tell you everything you need to know about the terms and conditions on which we will deal with each other. The term “you” refers to the customer or user or viewer of our website. “DrainBoss”, “us”, “we”, “our”, “ours” means DrainBoss Plumbing & Drainage Ltd. Registered in England No.08378950. 1. It is our intention that all the terms of the agreement between us (including details of the services and any goods or materials we are to provide) are contained in this document. If you have any queries or don’t accept any of the provisions included in these T&Cs, please contact us. 2. DrainBoss uses its own employees and suitably qualified independent contractors under authority from DrainBoss Plumbing & Drainage Limited to provide the DrainBoss Plumbing & Drainage service. The Water Jetting logo and City & Guilds accredited logos are displayed on this website as independent contractors used by DrainBoss for drainage work have these accreditations. 3. Independent contractors have no authority to incur liability on behalf of or to act as agent for DrainBoss Plumbing & Drainage Ltd or any of their licensees. 4. Quotations given by us are valid for twenty-eight days from the date they are given. We may change or withdraw any quotation at any time before you have accepted it. 5. We, or independent contractors used, will do our/their best to complete the work and provide the goods and materials for the quoted figure. However, unforeseen circumstances may incur additional costs above the quoted figure. In this event, we will let you know immediately and explain the reasons for the additional costs and ask you to accept an amended quote to cover the additional costs. We will always endeavour to park in a safe and appropriate manor. Some emergency callouts will require us to park in restricted zones in order to carry out the works. In this case, any parking penalties/fines will be passed onto the customer and they will be invoiced for cost of the penalty/fine. No additional admin fee will be applied in this instance. 6. The price payable by you is the price stated as the Total Due on the quotation and will be including VAT at the prevailing rate unless otherwise stated. There will be a minimum charge of one hour for any time spent on site within the first hour. 7. Domestic Customers will be invoiced immediately on completion of the work and The Total Due on the invoice is to be paid immediately. If the Total Due is not paid immediately, you may be required to pay an administration charge of £25.00 plus vat. The Company also reserves the right to apply a charge of 8% per annum, above the current base rate to any overdue payments. In the event of non-payment the fees from the Companies Collection Agency, will be added to the outstanding account (currently 17.5%). 7.1 All Commercial Customers will be invoiced on completion of the work and the Total Due on the invoice is strictly payable within 28 days of the date of the invoice, unless special arrangements have been made. If the Total Due is not paid within 28 days you will be required to pay an administration charge of £25.00 plus vat. The Company reserves the right to apply a charge of 8% per annum, above the current base rate to any overdue payments. In the event of non-payment the fees from the Companies Collection Agency, will be added to the outstanding account (currently 17.5%). 8. We can take payment via credit card. We will not process any credit card or debit card payments until contracted work has been completed, although card payments may be pre-authorised. If we do take payment by credit card, please note, we do not store credit card details nor do we share customer details with any 3rd parties. 9. An administration charge of £20 is payable in respect of each cheque we present for payment that is dishonoured by your bank for whatever reason. 10. Our standard business hours are 8am to 6pm Monday to Friday. We may be able to work outside our standard business hours at an additional charge. 11. We will not be liable for loss or damage to your property (including any cleaning needed) or any other type of loss unless we are responsible for it. If access needs to be made to your property for a repair to be completed, we, or any independent contractor used, will fill any holes and level the surface but will not replace the original surface or construction. Redecoration or repair of damage needed after completion of our work is your responsibility, unless we, or any independent contractor used was negligent. If an independent contractor was negligent it is a matter between the independent contractor and you. 12. You must let us, and any independent contractor used, know of any potential hazards or danger present to anyone carrying out work in your property. You must also ensure that there is a clear access to relevant drains and covers and provide us with access to mains electricity and water. If additional work or expense is incurred because you did not provide us with clear access, mains electricity and water, you may be charged for that additional work and/or expense. 13. We guarantee all parts and labour for 30 days from the date of completion of the work provided that our guarantee will not apply where faults are caused wholly or in part by your (or any other person’s) misuse or neglect of those goods and materials or as a result of fair wear and tear. Drain unblocking work will be guaranteed for 21 days. This guarantee is void if items such as wet wipes, nappies, sanitary items or any other foreign objects not designed for flushing into drain pipes is put into the drainage system post initial drain unblocking work and from when the guarantee starts. The guarantee is also void if blockages have been created from defected pipes, poorly laid & installed pipes, subsided pipes, pipes with root ingress, displaced joints, damaged or cracked pipe work. Our guarantee becomes void if any work carried out by another contractor, not authorised by DrainBoss, has worked on the same subject between our initial callout and any subsequent callouts by us. Any work obtained by DrainBoss and carried out by an independent contractor will have the guarantee that contractor provides and we will not be responsible for the guarantee or work carried out. Any guarantee we offer does not affect your legal rights including those rights under the Sale of Goods Act 1979 and the Supply of Goods and Services Act 1982. The Citizens Advice Bureau or Trading Standards Department will provide information about your rights. 14. Please note our fixed fee applies to a single blockage or single drain run that is not classified as having sewer abuse issues such as baby wipes/fat or building materials inside (for clarity please see the Thames Water definitions of sewer abuse on the internet) or defect pipe work such as poorly laid pipes, subsided pipes, displaced joints, root ingress, damaged or cracked pipe work. We also require a nearby access point; for the more problematic/difficult jobs, additional runs or secondary blockages on the same site we offer our hourly rate charged at half hour intervals after the first hour. 15. We will not be responsible for our failure to meet any of our obligations under this agreement because of circumstances beyond our control. 16. Tenants are required to get their landlord’s permission to allow us to carry out any work. Listed buildings may need planning permission. In both cases it is your responsibility to obtain any needed permission for the work. 17. Cancellation Rights. You are entitled to cancel an agreement. If you wish to cancel, you MUST CANCEL IN WRITING and deliver personally or send by recorded delivery or registered post to DrainBoss Plumbing & Drainage Limited at the address on the front of the quotation left behind by the technician at any time WITHIN 7 DAYS starting from the date the agreement is signed. If an independent contractor is used you must notify them in writing according to their cancellation rights policy. Notice of cancellation is recognised as being served as soon as it is posted or sent to us or if using email, from the date it is sent to us. 18. We may cancel the agreement at any time by giving you written notice. b. Aid making decisions on insurance proposals and insurance claims for you and members of your household. d. Check your identity to prevent money laundering, unless other satisfactory proof of your identity is provided. e. Carry out statistical analysis about fraud, credit and insurance. 20. In some circumstances we may discover when on site of the drainage problem, that your blockage is caused by failure of the public drain and, or sewers. In such circumstances, DrainBoss may reasonably reserve the right to apply a charge for their professional advice, having attended the site and diagnosing for you that the liability is not yours. In these situations you will be advised by DrainBoss, or independent contractor, that it is the responsibility of the water company. You will be advised that you should then approach your water company for compensation. 21. Telephone calls may be recorded for the protection of both parties, to help us in dispute resolution, and for training and quality purposes. Please see our call recording policy notice page for more information. 22. Customers of DrainBoss are entitled to a free camera inspection with all drain clearance work if further works are required and carried out by DrainBoss as a result of findings from the camera inspection. If no further works are required or carried out, a charge at the current rate will be applied. The term “you”, “your” refers to an independent contractor who is secured work from DrainBoss Plumbing & Drainage Ltd.
“DrainBoss”, “us”, “we”, “our”, “ours” means DrainBoss Plumbing & Drainage Ltd. Registered in England No.08378950. DrainBoss Plumbing & Drainage Ltd. may pass work onto suitable independent contractors. Your interactions with organisations and/or individuals from work secured through DrainBoss, including payment and delivery of services/goods, and any other terms and conditions, warranties and representations associated with such business, are solely between you and such organisations and/or individuals. You agree that DrainBoss Plumbing & Drainage Ltd. shall not be responsible or liable for any loss or damage of any kind incurred as the result of any such dealings. If there is a dispute between you and organisations and/or individuals through work secured through DrainBoss, you understand and agree that we are under no obligation to become involved. In the event that you have a dispute with one or more customers provided by us you hereby release DrainBoss, its officers, employees, agents and successors in rights from claims, demands and damages (actual and consequential) of every kind or nature, known or unknown, suspected and unsuspected, disclosed and undisclosed, arising out of or in any way related to such disputes and/or our service. If you are an independent contractor you agree to pay DrainBoss a success fee of an agreed percentage of the price of any work secured through our service unless otherwise agreed in writing. Work will be considered secured after we have passed the customer information to you and you have carried out work for the customer and been paid for some or all of the job or similar or related work. We will contact all customers once work has been completed to ensure they were pleased with the standard of work that was carried out and confirm the charges and payment terms. Domestic Customers must be invoiced immediately on completion of the work. The Total Due on the invoice is to be paid immediately. Our Success fee invoices to you for domestic customers have 14-day payment terms. Commercial Customers must be invoiced on completion of the work. Our success fee invoices to you, for commercial customers, are payable within 28 days. 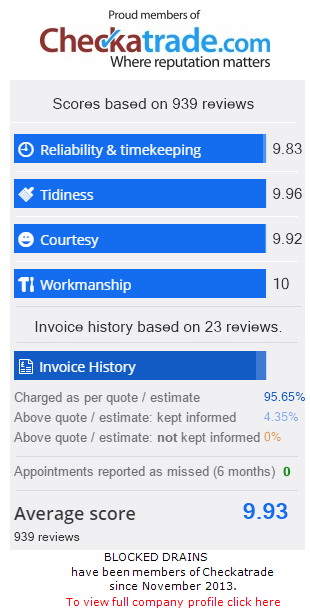 You agree you are responsible for paying our invoices within the payment terms of the invoice. If your account has an outstanding invoice which is greater than 7 days overdue your account will be automatically restricted and no work will be provided by DrainBoss until the balance has been paid. If you do not pay the Total Due within this time you may be required to pay an administration charge of £5 and interest will accrue on the outstanding amount at the prevailing rate plus 5% per annum until payment is received in full. If you pay by credit or debit card, you confirm that you are authorised to make such a purchase with the designated card. You agree to receive all invoices by email to the email address you have provided us. It is your responsibility to make sure that this email address is working correctly. Should any payment method you use be unsuccessful or the bank or card issuer later reclaim it you agree to pay any costs incurred by us plus a £20 administration fee.